In the draft, the Kansas City Chiefs added a dynamic offensive player. Presumably frustrated with not being able to get over the hump in the playoffs, perhaps they figured a new offensive star could take them to another level. The Chiefs drafted Patrick Mahomes, too. 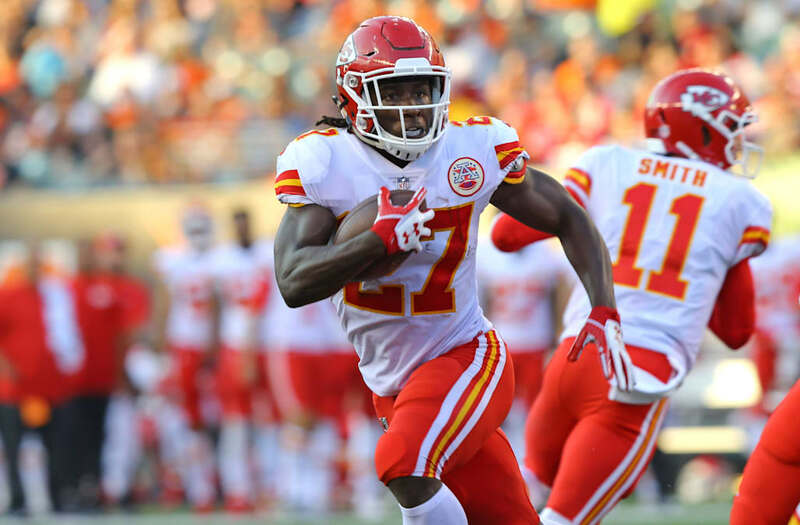 Mahomes was the star of the team’s draft class, but running back Kareem Hunt is the one who has changed the Chiefs’ offense right away. Kansas City couldn’t have known Hunt would be this good right away. If the Chiefs knew that, they wouldn’t have waited until the 86th pick to take him. But he looks like the kind of impact player that might finally get the Chiefs past the divisional round of the playoffs for the first time since Joe Montana was their quarterback. Sunday provided a good example of Hunt’s impact. The Chiefs were in a battle against the Philadelphia Eagles, trailing 10-6 late in the third quarter. Then Hunt took a run 53 yards for a touchdown. The Chiefs never trailed again. Although 50-yard runs look easy on Saturdays against disinterested college defenses, it’s not easy in the NFL. Hunt is the first NFL player since 1955 to have 50-yard touchdowns in each of his first two career games. A playmaker like that is special in the NFL. Hunt appears to be the kind of player who can change a game in an instant. While Hunt has five NFL touchdowns already, this is a bit out of the blue. He didn’t test like a guy who could break 50-yard touchdowns in the NFL. His combine was average at best, with a 4.6-second 40-yard dash and unimpressive numbers in other drills. That’s why he was still available for the Chiefs in the third round. Plenty of teams who passed on Hunt could use him now. The Chiefs were the second seed in the AFC last season, and they were a good team. But they lost their playoff opener as a couple decades of playoff disappointment continued. Maybe Hunt can change that. Coach Andy Reid knew how to use multi-dimensional backs like Brian Westbrook and Jamaal Charles, and he knows what he has in Hunt. The Chiefs seem to have the NFL’s latest superstar back, and he lifts their playoff ceiling significantly. Anyone remember the basketball player Tony Campbell? He was a good, solid playerwho ended up as the best player on the expansion Minnesota Timberwolves in 1989-90. And his first two seasons he averaged 23.0 and 21.8 points per game. His career best in any other year was 11.0. He scored a lot because it was a professional team and someone had to score. He did it by default. That might be Jermaine Kearse this season for the Jets. Kearse, who was traded to the Jets from the Seahawks right before the season, had two touchdowns on Sunday. He’s going to end up putting up decent numbers basically because someone has to. The fact that the Colts have ruled out Andrew Luck on Monday every week so far this season tells me he won’t be back anytime soon. If there was even a tiny chance of him playing, they’d keep that door open all week, if for no other reason than to keep the opponent guessing. He’s at a zero percent chance to play now. It’ll take a while until Luck is at 100 percent ready. Credit to the 49ers’ defense for nearly pulling off an improbable upset. Carlos Hyde going for 124 rushing yards against the Seattle defense was impressive. But 49ers coach Kyle Shanahan needs to figure out a passing game. Quarterback Brian Hoyer has 292 yards in two full games. Tom Brady had 294 in the first half alone on Sunday. You have to wonder how close the team is to trying out rookie C.J. Beathard. Corey Coleman’s broken hand is a tough blow. This is the second straight season he’ll miss time with a broken hand. Coleman has played well when he has been healthy, though his durability is becoming an issue. And Cleveland isn’t very deep at receiver (that Kenny Britt contract is looking really bad now). The Bears weren’t good to begin with, and now injuries are really piling up. Their top two receivers are on IR. They have four guards hurt. Inside linebacker Jerrell Freeman suffered a season-injury in Week 1 and his replacement Nick Kwiatkoski probably suffered a season-ending injury too. Running back Jordan Howard has an injured shoulder. They can’t overcome all that. I don’t really know why there’s a thought that AJ McCarron would be a significant upgrade over Andy Dalton. It won’t fix the offensive line, and McCarron would just be a new quarterback for Bengals fans to complain about. The Saints are allowing 512.5 yards per game. Only one other team (Patriots) is allowing more than 409 yards per game. I don’t think that pace continues all season … but I can’t guarantee it won’t, either. I’m not sure whether to be impressed they almost won a game in which LeSean McCoy had nine yards on 12 carries, or be concerned they couldn’t win a game in which they gave up 255 yards and no touchdowns. Buffalo had 176 yards and 10 first downs, and now gets to play the Broncos’ defense in Week 3. The blowout against the Titans was a rough loss, because it erases all the momentum from that Week 1 win. It also was a reminder that Blake Bortles hasn’t gotten any better. While there will be plenty of criticism for Ben McAdoo’s play-calling and the offense in general, it might be a different game Monday night if Brandon Marshall doesn’t drop a pass that hit his hands down the sideline. It was 17-10 early in the fourth quarter at that point. A catch by a wide-open Marshall gives the Giants first down in Lions territory. Instead he dropped it, and the Lions returned a punt for a touchdown two plays later. Chris Johnson looked OK, gaining 44 yards on 11 carries. Kerwynn Williams wasn’t so good, with 22 yards on nine carries. The Cardinals have to patch together a run game without David Johnson, and Johnson is going to be out a couple months. The Cardinals probably can’t get very far riding Carson Palmer and Chris Johnson for half of a season or more, but what choice do they have? If we’re being realistic, the Texans’ offense still looked terrible last week. Quarterback Deshaun Watson got very little going outside of one big run. Every week is going to be a struggle until the Texans figure out how to generate some points. Todd Gurley looked great with 136 total yards, a couple of touchdowns and one fantastic hurdle. The Rams lost, but seeing Gurley play his best game since his rookie year is a clear positive. Maybe it’s time for Washington to at least see if Chris Thompson can handle more carries. The past two seasons, Thompson averaged 6.2 and 5.2 yards per carry. Yet, he has had double-digit carries in a game only once (12 carries, 73 yards vs. Detroit last season). Thompson had 77 yards on three carries Sunday and was Washington’s best player. It can’t hurt to find out if he’s capable of more. The Chargers had two last second field goals to tie a game at Denver and win a game over Miami. Instead they’re 0-2, two games behind all three teams in a tough AFC West. Remember always that the margins of error in the NFL are incredibly thin. Jay Ajayi had 28 carries on Sunday. Every other running back on the roster had one combined, a 3-yard loss for Kenyan Drake. Miami needs to figure out some depth, because Ajayi can’t hold up with that many carries. The London trip will be a little tricky for the Ravens. Jacksonville’s defense is legit, and the Ravens aren’t great on offense. But the Ravens are really good on defense. Baltimore would be happy with a low-scoring, ugly win overseas. Ziggy Ansah looking healthy again, and him getting three sacks on Monday night (even if they came against stuggling Giants left tackle Ereck Flowers) is great news for the Lions. He’s a true difference maker for the defense. Doug Martin sat out with a suspension. DeSean Jackson had 39 yards. Tampa Bay’s two talented tight ends had three catches combined. And the Buccaneers still led by 26 at the half. Sure it was against the Bears, but it was a great opener. It’s hard to take much from Sunday’s loss without Sam Bradford. The problem is, he’s no sure thing to stay healthy for the final 14 games. Now the Titans’ Week 1 loss just reflects well on a good Raiders team. What the Titans did Sunday – their final seven drives against a good Jaguars defense resulted in four touchdowns, two field goals and killing the clock by taking a knee – serves notice that Tennessee was worth all that preseason hype. A lot of teams are going to lose at Kansas City this season. The Eagles played them tough. Carson Wentz was good on third downs against the Chiefs; the next step is becoming more consistent on first and second down. The Panthers had just nine points on Sunday and were struggling to move the ball. So why did Christian McCaffrey get just 12 touches? McCaffrey didn’t seem to be an obvious fit in the style of offense the Panthers have played the past couple seasons, and it seems the Panthers are still figuring out how to best use their rookie back. I’m not sure what to make of Seattle now. The offense has been really bad. The Packers didn’t look great on defense against the Falcons, the 49ers were only OK on defense against the Panthers, and those two opponents held the Seahawks to one touchdown in eight quarters. Maybe the Seahawks are trying to tell us they’re not that great this season. Next Sunday at Tennessee will be a great test for that. Sometimes you just run up against a team that gives you matchup problems, or simply has a great day. I don’t think Sunday’s blowout loss at Denver is indicative of what Dallas is. It’s just a reminder that what Dallas did last season, going 13-2 before sitting out Week 17, was always going to be nearly impossible to duplicate. You could make an argument that the best team so far this season is this one right here. Ignore the last part of the fourth quarter against the Chargers, because there were a couple fluky turnovers there. If you take out that Chargers surge at the end, the Broncos outscored the Chargers and Cowboys 66-24, and those are two tough opponents. Why does it look like the Broncos are so much better? Trevor Siemian will be the common answer. What has changed most is the run defense. Denver was 28th in run defense last season. On Sunday, they held rushing champ Ezekiel Elliott to 8 yards. The Packers seemed hamstrung with their play-calling on Sunday night. Both tackles were out, Jordy Nelson dropped out early and Randall Cobb was knocked out late. If they play the Falcons again in January the game would look a lot different. And that rematch might happen. Two games in, Derek Carr has a 126.5 passer rating. It’s early, but if you picked Carr to win MVP this season, you should feel pretty good about it. Not every question was answered, but this was mostly the Patriots team we expected to see. I still believe this is likely the best team in football, or will establish itself as such by the end of the season. Probably fair to say not enough was made of Justin Houston having a healthy offseason, unlike last year. He has three sacks in two games and should make a strong run at NFL defensive player of the year. We have to acknowledge that Kyle Shanahan’s new team hasn’t scored a touchdown, while the Falcons with Steve Sarkisian calling plays looked like a machine for most of Sunday night. While not taking anything away from Shanahan’s remarkable 2016 season, maybe his departure wasn’t that big of a deal if you still have Matt Ryan, Devonta Freeman and Julio Jones. Le’Veon Bell ground out 87 rushing yards on 27 carries. He still doesn’t look quite right. You can probably chalk up two games to him getting in football shape. If it extends into a third week, you’d have to call that a slump.